“Binosaur” is not a real word. You got me! But perhaps it could be. Left-hand column: Triceratops mount at the Royal Belgian Institute of Natural Sciences; Majungasaurus as depicted by Alice Turner; and a fibreglass model sauropod from Port Lympne, UK. Right-hand column: Kmart Halloween decoration; the eternally screaming Christmas lights at my house; and Disney/Pixar’s The Good Dinosaur. Binosaurs may in some cases resemble dinosaurs to the untrained eye, but they’re not really the same thing. Dinosaurs were real animals that lived millions and millions of years ago, the remains of which we sometimes discover and study; binosaurs are imprecise, wonky representations of the aforementioned, where no real care has been taken over the accuracy of the depiction. Carcharodontosaurus is a dinosaur; Barney is a binosaur. Does “binosaur” simply mean “crap representation of a dinosaur”? Almost, I suppose, yes, except that I don’t generally consider outdatedly inaccurate palaeo-art to belong in the binosaur bin. Binosaurs proper are characterised by a disregard for scientific canon – Victorian-era dinosaur art that looks silly today is not an example of a binosaur, if the artist did their best to represent the animal truthfully with the information they had available. Otherwise, much of today’s best and most accurate palaeo-art could therefore be classified with the “binosaur” tag on the basis that future scientific advancements would be bound to make a lot of our modern dinosaur reconstructions outmoded and redundant. A true binosaur doesn’t represent a strong commitment to realism. Binosaurs are everywhere. Jurassic World has certainly got its share of them. And you know those big-bags-o’-dinos you get in cheapo toy shops? Full of binosaurs. If you see Dimetrodon in there, that’s a good sign you’re actually looking at a binosaur bag, because manufacturers of economy plastic toys can’t seem to resist sticking him in where he doesn’t belong. 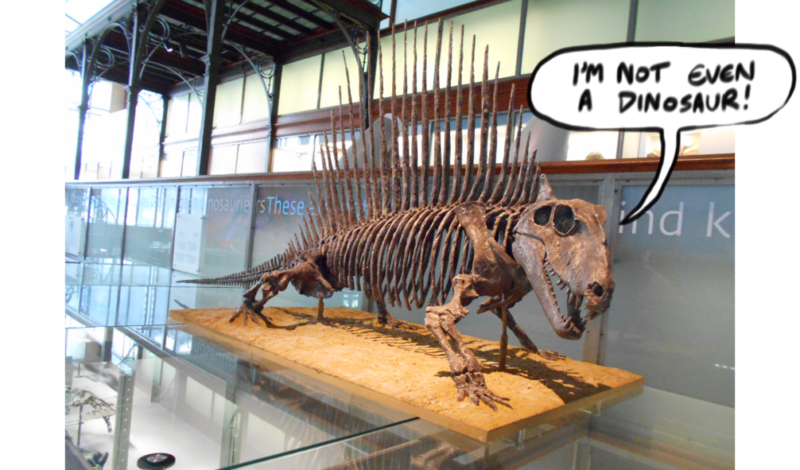 Dimetrodon at the Royal Belgian Institute of Natural Sciences. Carelessly inaccurate representation of a dinosaur (or prehistoric animal often mistaken for a dinosaur, e.g. a pterosaur or marine reptile). 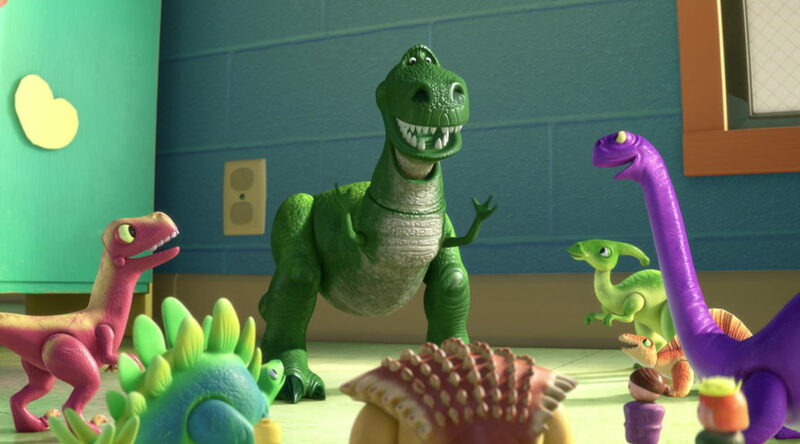 Most binosaurs are harmless and fun – nobody thinks Rex from Toy Story is an actual, accurate tyrannosaur. 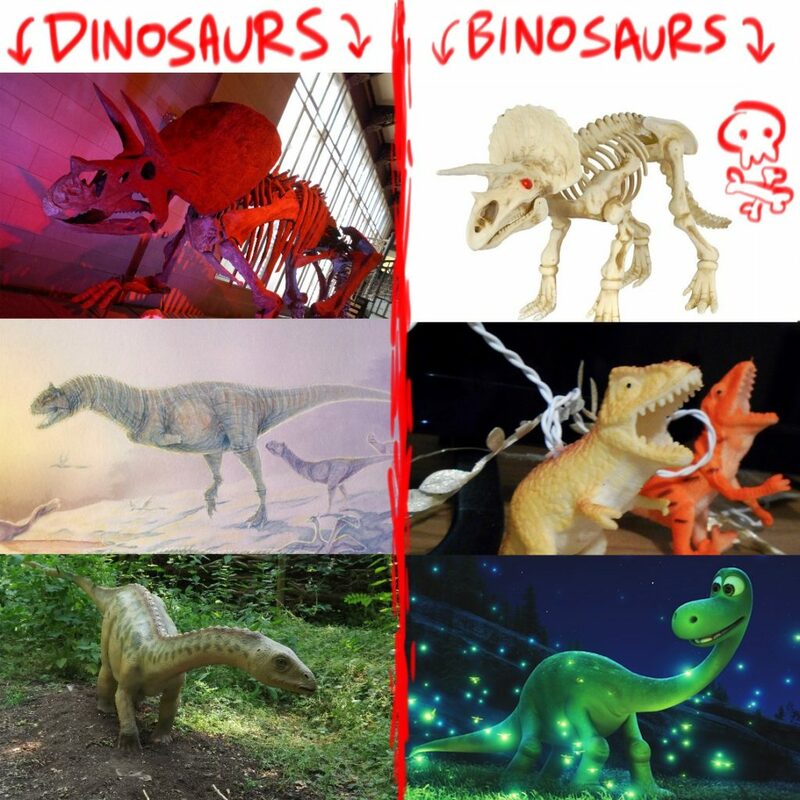 But sometimes they are presented in contexts that are misleading, and a layperson might think that a dinosaur actually looked that way (as in the case of the Stegosaurus depictions in the Jurassic World movies, or just about everything in Ark: Survival Evolved). That’s where binosaurs can be a problem. Please don’t present something as if it might be a realistic dinosaur without bothering to research it and actually get it right! It’s not like we don’t live in an age with an overabundance of freely available information, and trying to turn a profit by lazily spreading incorrect ideas about palaeontology serves only to (a) undermine the efforts of the hardworking scientists who worry about public outreach, (b) annoy those people who do know what dinosaurs are supposed to look like, and (c), perhaps most importantly, make the world a tiny bit dumber and more backward. Writing this blog is a perennial balance between wanting to write about scientifically accurate dinosaurs and worrying that I’m being a grump who wants to fastidiously deconstruct and ruin things that people enjoy. Nobody likes the “Actually…” guy. The vast majority of binosaurs are fun, joyous things, and I’d hate to take them away from anybody. So let’s end this post with a celebration of awesome binosaurs! From left to right: The Land Before Time, Jim Henson’s Dinosaurs, Yoshi, Dino from The Flintstones, and Ron Raptor! What do you think, dear reader? Have you encountered any good binosaurs you’d like to share? Stick ’em in the comments! I’d love to hear your take on this.